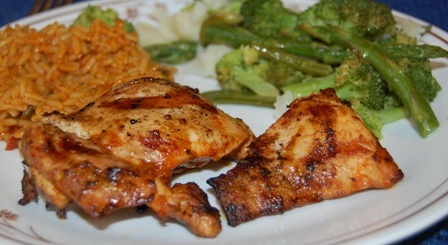 Durkees Chicken Thighs | What's For Supper Tonight? It’s a cold and rainy night, but the chef bravely headed out to the deck, to barbecue the chicken thighs. In the summer, he broils them in the oven, for about 20 minutes, and they’re almost as delicious as the barbecued ones. You can see the picture below the recipe. When we started making these, years ago, the hot sauce was made by Durkees, so that’s what we still call it , most of the time. Now, the hot sauce is called Frank’s Redhot Sauce, which is the sauce used on the original Buffalo Chicken Wings (I think). Anyway, whatever it’s called, the sauce is delicious, and chicken thighs are easier than wings to eat, and better for your health! Place butter in small bowl and melt in microwave, approx. 15 sec. Cook over medium high flames for 15 minutes, turning occasionally. Broil for 10 minutes, then turn the thighs over, and brush with additional hot sauce, if desired. Pingback: Weekly Meal Plan 20160528 | What's For Supper Tonight? Pingback: Weekly Meal Plan 20160618 | What's For Supper Tonight? Pingback: Weekly Meal Plan 20160709 | What's For Supper Tonight? Pingback: Weekly Meal Plan 20160730 | What's For Supper Tonight? Pingback: Weekly Meal Plan 20160820 | What's For Supper Tonight? Pingback: Weekly Meal Plan 20161001 | What's For Supper Tonight? Pingback: Weekly Meal Plan 20161029 | What's For Supper Tonight? Pingback: Weekly Meal Plan 20161126 | What's For Supper Tonight? Pingback: Weekly Meal Plan 20161231 | What's For Supper Tonight? Pingback: Weekly Meal Plan 20170128 | What's For Supper Tonight? Pingback: Weekly Meal Plan 20170318 | What's For Supper Tonight?